Packed in a modern strong plastic vacuum pouch by one of Thailand's premier food manufacturers, Thai Agri Foods Aloe vera is naturally rich in vitamins, minerals, amino acids and enzymes that help to maintain tone of blood vessels, promote good circulation and decrease stress. This product has large "jello-like" chunks of aloe vera in a syrup. 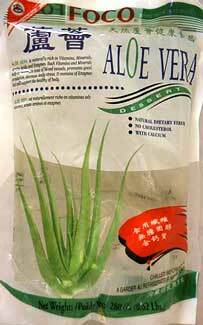 Ingredients: aloe vera, water, sugar, phosphoric acid, ascorbic acid, calcium lactate, artificial flavor. Product of Thailand.